Home Blogs How Do You Make a Difference? 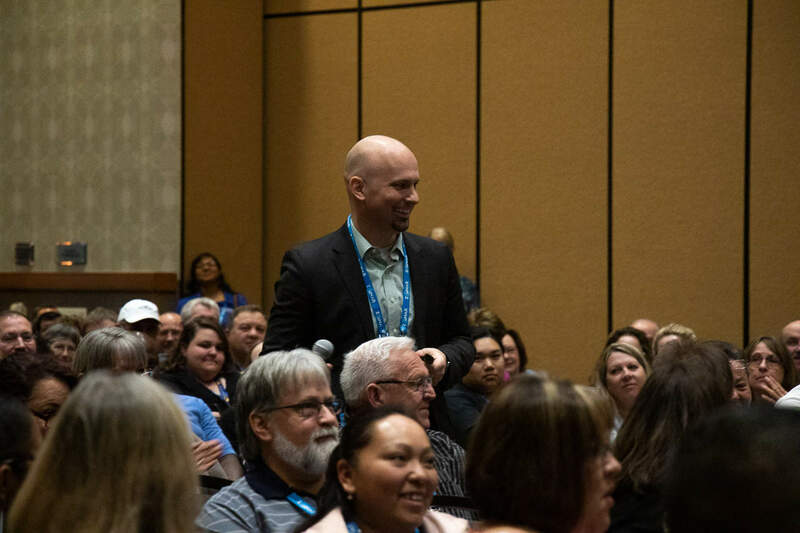 From the moment TSD Conference keynote speaker Patrick Mulick stepped on stage last month, he had his audience’s attention. The hour and a half only grew more memorable as he shared his personal story, perspective, wit and wisdom to remind the attendees why they had decided to make a career of transporting students with special needs. Then, he told of his fight last year with cancer and how it translated to his lifelong work with children with disabilities, especially autism. Mulick described the trials and tribulations he and his family went through when he received the life-altering news in January 2018 that he had inoperable non-Hodgkin’s lymphoma. He recalled the utter shock and self-reflection he experienced during this “transformational” moment in his life. Thankfully, he was declared cancer-free in August, after 600 hours of intense chemotherapy. His treatments left him temporarily disabled and relying on a team of medical staff, family and friends to survive. He said most of us are all temporarily-abled, and he pointed out that the dignity and respect we would want when we have to rely on others is the same that children with disabilities need and deserve, today. Mulick said all people have deficits, or special needs, but most people aren’t judged by them because they are largely invisible. He asked the attendees to share with each other one thing that they are awful at and introduce themselves by their personality flaw rather than by name. One attendee shared with me that he was a procrastinator. Another said she was always late. Admittedly, I quickly get distracted and jump around too easily from project to project. We all have things we could be better at in life. What’s one area you can improve? Once you identify that weakness, or “disability,” then you can ask for help to turn that into a strength. It’s vitally important that we help each other as a community of professionals. We all go through challenges. Some you can see, most you can’t. Mulick shared that as human beings it’s easy to get burned out. That happens because people forget why they do what they do. What motivates you? He challenged the audience to consider the perspective of the children they transport. Thoughts impact emotions, which impact behavior that impacts the outcome, Mulick said. Driving the school bus can too often be a thankless job. Whatever the challenges you face, somehow the yellow bus shows up and gets the job done. I know it takes an army of passionate people behind the scenes to make it all happen. The end result is supporting the kids and families in your communities. He asked the attendees to take the time to get to know their students and their interests. Doing so can unlock their potential and lead to life-long growth and achievement. Patrick’s message of “Make a Difference” resonated with the TSD Conference attendees. They felt instantly connected, as children and their safety are the common threads driving many school transportation professionals. Many in the audience are solely dedicated to supporting kids with special needs. Mulick illustrated the role that advocates play in the lives of students with disabilities via several videos, a few of which showed interviews conducted by special education teacher Chris Ulmer. Ulmer’s videos give a voice to these children by allowing them, in their own words, to describe their hopes and dreams, likes and dislikes. The videos show the children as what they are, children, and shatter the disability label by revealing each child’s personality. The only shoes you can walk in are your own and with compassion, courage and understanding. We are all part of each others support systems in the school bus industry. Let’s walk together, side by side and make a difference! Editor’s Note: Reprinted from the April 2019 Publisher’s Corner.